The Feds’ eyes in the skies buzzed around the inauguration, but not the Women’s March. 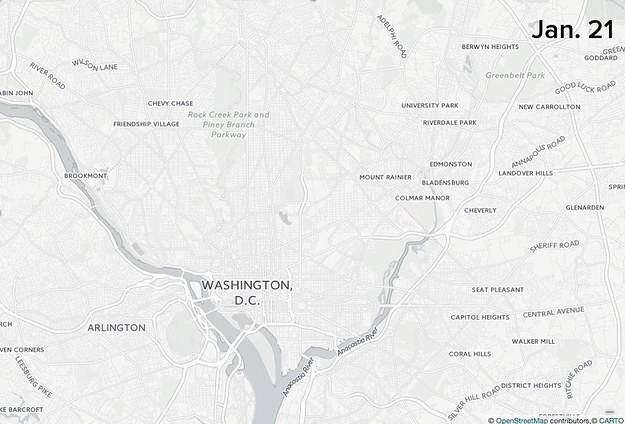 BuzzFeed News watched last weekend’s aerial surveillance over the nation’s capital and other major cities. As President Donald Trump took the oath of office on Friday, federal surveillance helicopters were buzzing the event’s perimeter. But the Feds’ eyes in the skies apparently had little interest in Saturday’s Women’s March on Washington. 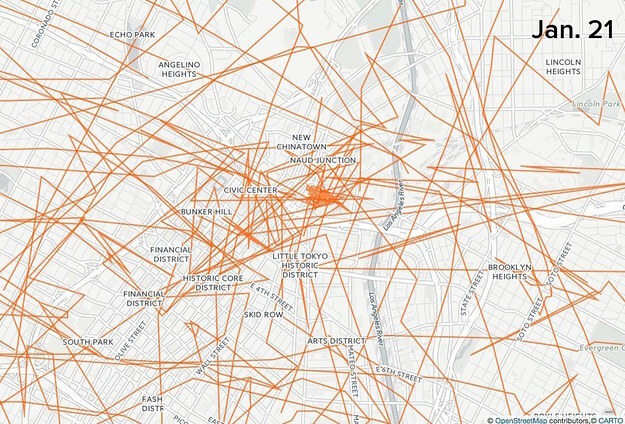 Protests in several other major cities also seemed to pass off without intensive aerial surveillance — although those in Oakland and San Francisco were watched closely by state and local police. Surveillance and security for public events and protests are hard for outsiders to monitor. But the helicopters and other aircraft operated by law enforcement send transponder signals that are tracked by flight-monitoring websites. 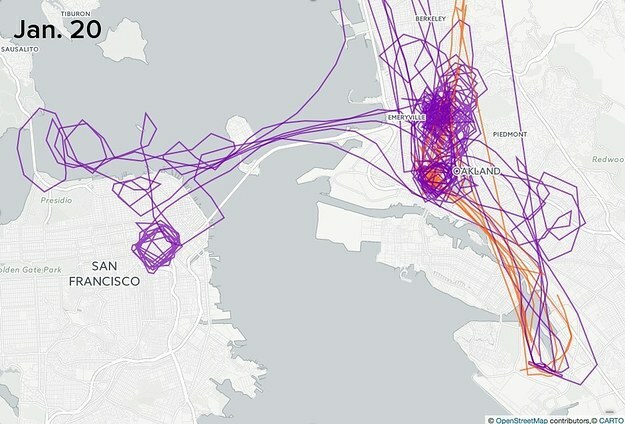 Over a weekend that saw hundreds of thousands of Americans take to the streets, BuzzFeed News used two of these sites, Flightradar24 and ADS-B Exchange, to watch the skies over Washington DC, New York City, Los Angeles, Chicago, and the San Francisco Bay Area. On Saturday, these cities hosted some of the largest protest marches across the nation. Flightradar24 uses both crowdsourced data and a feed provided by the Federal Aviation Administration (FAA), but may hide certain planes if requested by their operators. ADS-B Exchange is completely crowdsourced, and does not censor its data. We looked for aircraft operated by federal, state, and local law enforcement — including those registered to companies previously identified as fronts for federal aerial surveillance. Both sites have good coverage for the cities we monitored, and revealed essentially the same picture — federal, state, and local law enforcement aircraft were apparently not trying to hide from view. As a designated National Special Security Event, the inauguration was under close scrutiny — federal helicopters were in the air for most of the day. They included Department of Homeland Security (DHS) choppers, plus two registered to Midwest Aerial Imaging and TAFY Consulting. Documents submitted to the FAA that reveal the the former’s choppers are part of the DHS fleet; the latter registers its aircraft to a PO Box used by the FBI. These helicopters patrolled a perimeter around the Mall and the US Capitol, where crowds gathered for the inauguration. The most intense surveillance was above a corridor to the north of the Mall that includes Washington’s bohemian restaurant district and the historically black Howard University. A DHS chopper also circled around the campus of the University of Maryland, to the northwest. But we detected no law enforcement aircraft on Saturday, when hundreds of thousands of women and other protesters marched in Washington DC. 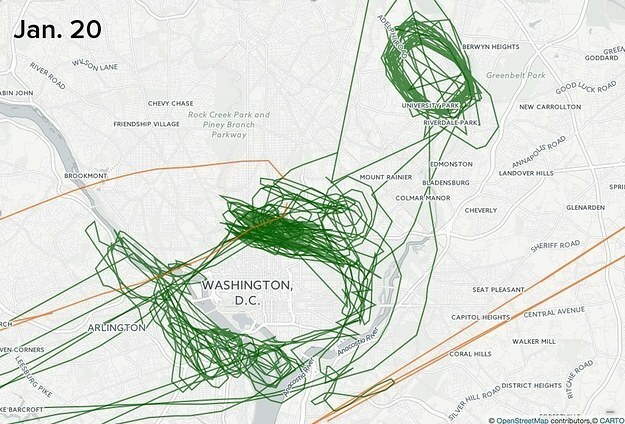 Federal officials would not comment on these patterns of aerial surveillance — although the FBI has previously told BuzzFeed News that its aircraft do not monitor activities protected by the First Amendment, which would include Saturday’s peaceful protests. “As a matter of policy, we do not discuss law enforcement techniques or practices,” acting DHS press secretary Gillian Christensen told BuzzFeed News by email. The Secret Service, which coordinated security for the inauguration, also declined to comment. According to a DHS statement issued on Tuesday, security for the inauguration involved more than 50 agencies, including the military. The NYPD has an extensive fleet of helicopters, but they were not especially busy over the inauguration weekend. On Friday, they monitored bridges over the East River, which is a common pattern. On Saturday, a lone NYPD chopper meandered over Manhattan. We detected no law enforcement flights over the city on either day. Both the LAPD and the Los Angeles County Sheriffs Department were in the air over downtown Los Angeles on Friday and especially on Saturday. But they did not seem to have a tight focus on the women’s march, which ended at City Hall. 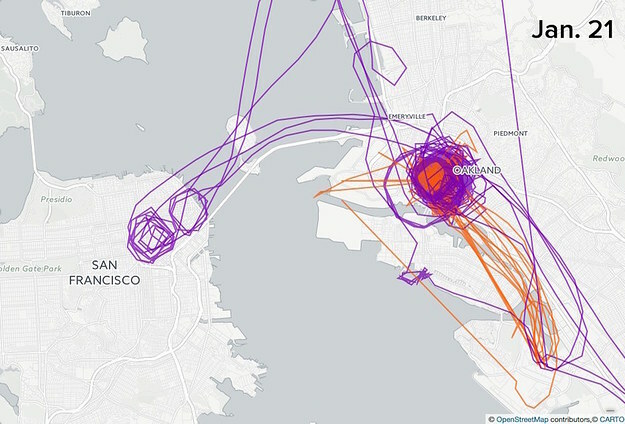 The San Francisco Bay Area was a notable exception to the pattern of sparse aerial surveillance of the weekend’s protests. Both on Friday and Saturday, the Oakland Police and the California Highway Patrol (CHP) circled downtown Oakland, where protesters gathered over the weekend. 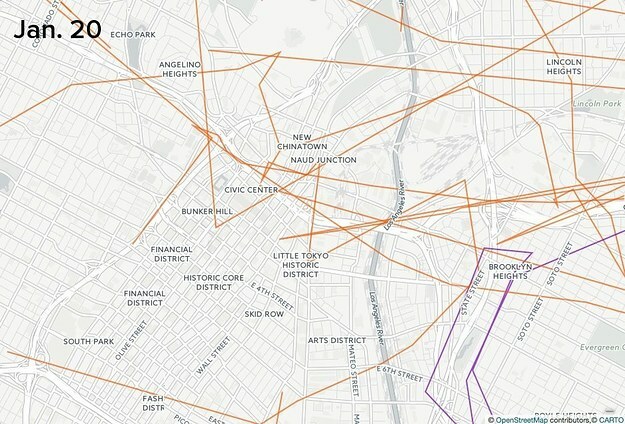 The CHP also circled protest locations in San Francisco, including City Hall. The CHP dispatched a small plane and a helicopter to the Bay Area. Spokesperson John Fransen told BuzzFeed News by email that the surveillance was related to concerns about the safety of protesters, pedestrians, and motorists. In July 2016, Black Lives Matter protesters closed the I-880 freeway for several hours, after marching from Oakland City Hall.